This old picture shows the original bronze plaques. 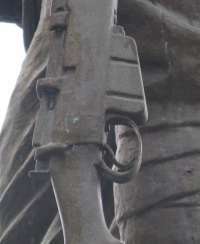 Cassidy's details show typical British equipment: the rifle is clearly a short-magazine Lee Enfield. The soldier wears 'puttees' for trench warfare, bandages made of wool serge wrapped around the lower part of the legs, which were thought more serviceable than the knee-length leather boots favoured by some other armies. We have transcribed the names from the memorial into the table on the right. The replacement plaques are not neatly made, and the layout can be confusing: we have changed the layout a little to save space. The many World War I names are arranged, as on the original plaques, by abbreviated name of regiment, whereas the World War II ones are a single, and as usual, much shorter, alphabetical list. The original plaques may contain errors, and we may well have added others. Corrections are very welcome. Two soldiers, Private John Cowgill and Sergeant Harry Makinson, are shown as having been awarded the Military Medal, a decoration introduced in 1916 for bravery in battle on land. 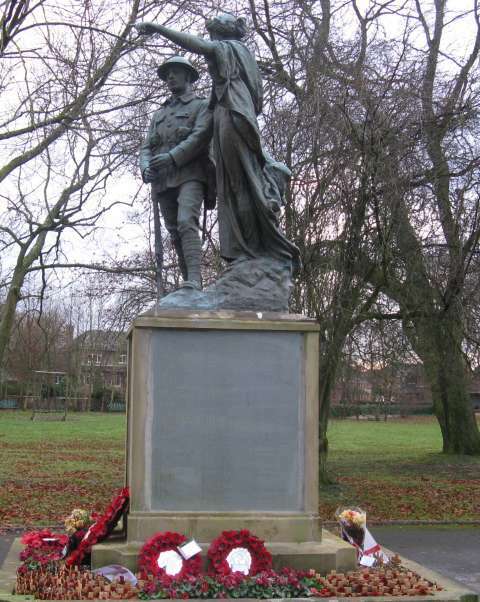 The East Lancashire Regiment was the local regiment, into which many local men volunteered or were conscripted. 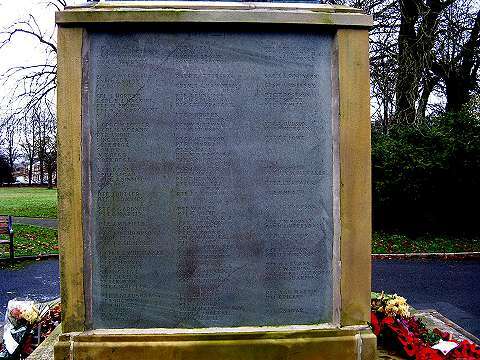 Many joined the 11th Battalion, the 'Accrington Pals', which took part in the first attacks of what became known as the Battle of the Somme, on 1 July 1916. Ordered to walk forward directly into German, machine-gun fire, from 720 Accrington Pals in the attack on the hilltop fortress of Serre, 584 were killed, wounded or missing. In all, 58,000 British troops (one third of them killed) were lost on that single day. A variety of other regiments are represented: the list includes people born in Clayton who had moved away from the area, and others who had moved to Clayton, but on outbreak of war, rejoined their original regiment. Other Clayton men fought and died at Gallipoli, in Mesopotamia, and elsewhere. More details of the World War I fallen can be found on the excellent Greater Accrington Roll of Honour website. The 1914-18 dead are almost all from the various regiments of the Army. The 1939-45 list is very different, with the Royal Navy and the Royal Air Force predominating, reflecting Britain's different history in that conflict as well as the realisation by commanders that walking into gunfire to gain a few yards of ground could in most cases no longer be countenanced. In the modern era, against the 'insurgents' with their suicide bombs and booby traps in the middle and far east, the Army again heads the casualty lists, and the Clayton fatalities of 1952 and 2008 are again from the army. The resources on the Internet today allow a much to be discovered about the people named on war memorials. As an example, we'll look at the Royal Engineers listed. 2nd Lieutenant Henry Herbert Bradshaw, 74th Field Company Royal Engineers, was an assistant to S.S. Platt, the Borough Surveyor of the town of Rochdale. He married Catherine Howarth on 19 May 1915, and enlisted as a reserve in the Army in November 1915, being called up for service as a Sapper (equivalent to a Private) in May 1916. 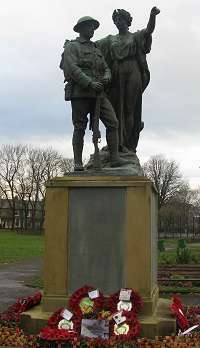 Pioneer Charles George Kilby, of 303rd Road Construction Company, Royal Engineers, was born in Mitcham, Surrey in 1865. He was 52 years old when he joined the Pioneer Corps, an army corps for men not considered fit enough to fight, but able to support the Army in building, transport and other tasks, in 1916. He died of Pneumonia due to Influenza (like millions of others in the disastrous epidemic raging at the time) in a field hospital near Boulogne on 29 November 1918, only just after the armistice was signed to end the War on 11 November. He is buried in a cemetery near the ferry port of Boulogne; his widow eventually, after bureaucratic delays, and writing a letter saying they 'could not live on no money' received a pension of 35 shillings a week to support her and their four children. Driver Richard Battersby, 74th Field Company, Royal Engineers, was killed in action, aged 32, on 9 June 1918, and is buried at Duisans British Cemetery in northern France, which from May to August 1918, as used by divisions and smaller fighting units for burials from the front line. Sapper James Alfred Robinson, born in Clayton, was one of 210 men lost at sea when the troopship Cameronia (a commandeered transatlantic liner of the Anchor Line) was sunk by a German submarine U-33 on 15 April 1917, 150 miles east of Malta while carrying 2,650 soldiers from Marseille to Alexandria; he is commemorated on the Chatby Memorial, Egypt. Driver John Patrick Fitzpatrick, of 296 Army Field Company, was just 22 when he was killed on 14 November 1942 soon after the first landing of the Allies in Algeria at the start of the North African Campaign, and is commemorated on the Alamein Memorial in Egypt. Sapper Fred Waddington, aged 25, of 238 Field Company, died in Tunisia, on 18 June 1943, some time after the surrender of the Axis forces in North Africa which took place on 11 May, but before the start of the invasion of Sicily in July. During this period the Royal Engineers would have been involved in clearing minefields and other highly-dangerous work. Of the Cassidy-designed war memorials we have visited, this is the only one to have added the name of a soldier fallen in battle in the year 2008. 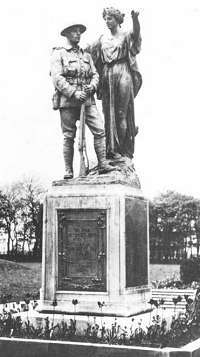 The War Memorial in the Lancashire town of Clayton-le-Moors was unveiled on 6 November 1920 by Major-General A. Solly-Flood. It features a bronze sculpture modelled by John Cassidy and cast by the firm of Parlanti (given as 'Barlatti' in the source article, but there was no such firm, whereas Parlanti of Fulham was a well-known foundry used by sculptors). The simple stone pedestal carries plaques on all four sides, which are not original and appear have their lettering carved into sheets of slate. Apparently the original bronze plaques were stolen - no doubt for their scrap value - some time around 1970. The front face of the pedestal has the inscription transcribed in the left column, and the other three faces carry lists of names, transcribed to the best of our ability at the bottom of this page. 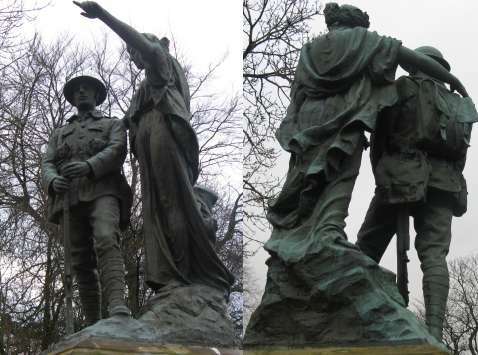 The sculpture is of interest in that it appears to combine Cassidy's two memorial themes into a single work: the soldier (Heaton Moor, Colwyn Bay) and 'Winged Victory' (Eccles, Skipton, Stourbridge, Irlam). 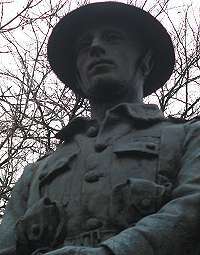 In fact it pre-dates all those, and is Cassidy's first War Memorial bronze. The allegorical female figure has taken the soldier in hand and is showing him the way to peace ... or victory? A review of the Manchester Academy of Fine Arts 1920 annual exhibition in the Manchester City News (31 January 1920) mentions 'a small version of the heroic group by Mr John Cassidy that was on view in his studio two months ago and which is now being cast for a town in Lancashire.' This is probably the one referred to. Despite the obvious comparison which might be made with the propaganda image of a mother indicating to her son where his duty lay ('Go! It's your duty lad, join to-day'), the allegorical nature of the female figure seems to distance her from such a specific interpretation ... the iconography of the Clayton memorial is also remarkably similar to the imagery of popular cards produced during the war for wives, girlfriends and mothers to send to their loved ones overseas. If Cassidy himself explained the meaning, we have yet to discover any record; to the casual visitor, the work is left to explain itself with only the anonymous poetic inscription as a guide. Mercer Park, location of the memorial, is formed from the grounds of Mercer House, home of John Mercer (1791-1866) the 'father of textile chemistry.' He invented Mercerisation, a process for the treatment of cotton fabric. He provided land and funds towards the building of All Saints Church, next to the Park, as well as a public library and reading room. 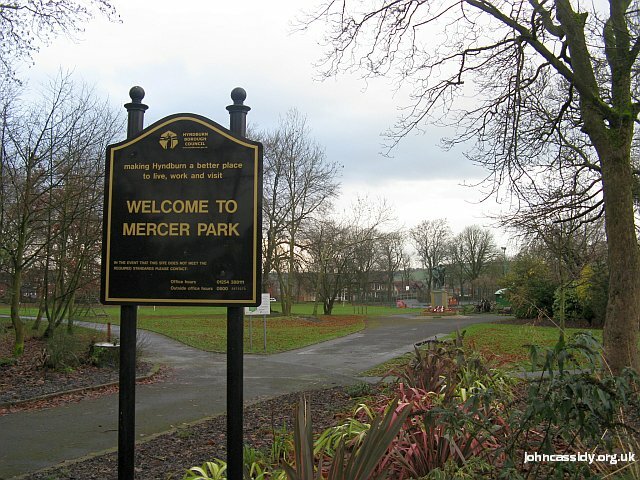 His house and grounds became a public museum and park under under the will of Maria Mercer, John Mercer's last surviving daughter, who died in 1913. The building still exists, owned by the council, but is no longer used as a museum. Richard Broughton, a historian and trustee of Miss Mercer's will, officially opened Mercer Park in June 1916. 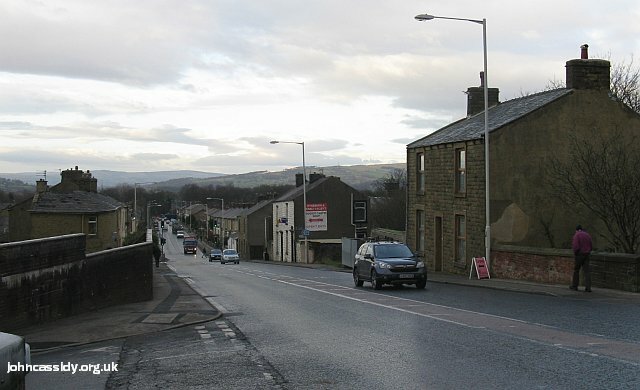 Clayton-le-Moors, at it looks today, is a small town not far from Accrington, which grew around the bridge carrying the road over the Leeds - Liverpool Canal at this point, although a small village had existed here for centuries to serve Clayton Hall, home of the de Clayton family. The view above is from the bridge, looking towards Gt. 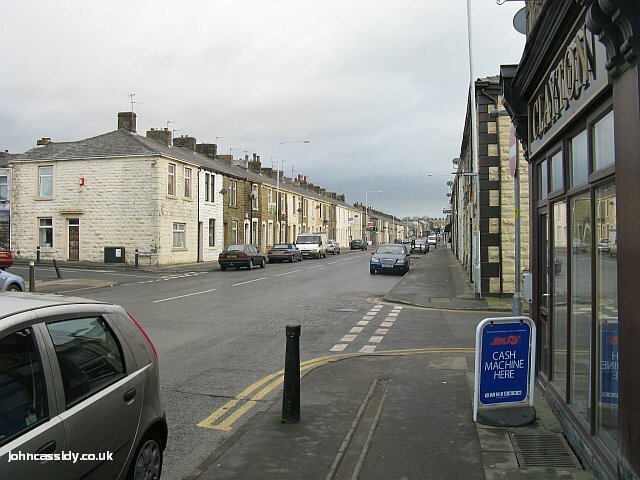 Harwood, Whalley and Clitheroe, taken, like all our own pictures on this page, in November 2008. Terraced housing lines the main road, no doubt built for the workers in the local textile factories, all of which had closed by the 1960s. 60 and more years ago a common sight here and everywhere in the industrial towns of the north would have been the housewives busy cleaning their front doorsteps with 'donkey stones' - a 94-year-old lady was found by the local press reviving the procedure in 2009. PTE. A. PRESTAGE, 1ST E. LANC. REGT. PTE. C. HILLMAN, R.WELSH. REG. PTE. J.L. RAWSTRON, 2ND BN. PARA. REGT.